Flyball is run in teams of four dogs, as a relay. The course consists of four hurdles placed 10 feet (3 m) apart from each other, with the starting line six feet (1.8 m) from the first hurdle, and the flyball box 15 feet (4.5 m) after the last one, making for a 51-foot (15.5 m) length. The hurdle height is determined by the shoulder height of the smallest dog in the team. Each dog must return its ball all the way across the start line before the next dog crosses. Ideal running is nose-to-nose at the start line. The first team to have all four dogs cross the finish line error free wins the heat. Penalties are applied to teams if the ball is dropped or if the next relay dog is released early. Currently we do not have a flyball trainer or enough people to form a team. Please contact us if you are interested in flyball and are able to travel. It is important that you be willing to travel to competitions. 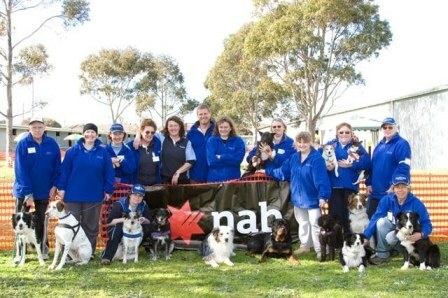 If you would like to know more check the Australian Flyball Association site.